In the mood for a cozy, post-holiday read? I suggest you give Maybe This Time a try. 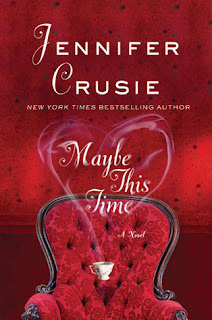 I first discovered Jennifer Crusie through the insanely entertaining Bet Me. I then immediately went on a Crusie binge. And though I enjoyed several of them, none quite matched up to that first one. So I'd been kind of avoiding another Crusie read, even after hearing very positive reviews of her newest. The fact that it was categorized as a mystery/romantic suspense piqued my interest, but when I received it as a gift awhile back, I placed it on my nightstand and promptly forgot about it. Sometimes you have to wait until the right time for a certain book rolls around, you know? I've made my mistakes trying to force a book at the wrong time, and it never accomplishes anything but driving a rift between us. So I waited on this one. And the right time rolled around (as it almost always does) a few nights back. I'd been bouncing around from book to book for awhile, searching for the one I needed. What a relief and a surprise to find it was the unassuming little ghost story that had been patiently sitting on my nightstand lo these many months. Andie Miller is trying to do the right thing. Walking into her ex-husband North Archer's law office to sever all remaining ties seems to be, by all accounts, the right thing to do. Even if it is almost impossibly hard. After all, they have been divorced for ten years. And the single torrential year they were married ended so spectacularly badly it almost crushed Andie. They've both moved on since, and it's time for some closure. But when she sits down with North, the man who never asked anything of her while they were married now has a favor to ask. Will she travel down to one of the family estates where his two young wards are living? Their aunt died not long after their parents did, and it seems there's some trouble keeping a reliable caregiver in the house. Could she possibly go down and check on them, see if she can get them ready to attend school? Then in just a few weeks' time they'll be done with each other for good. She can go off and marry her fiance and start that calm and peaceful life she's been looking for. In the face of the hefty wad of cash North is offering her in exchange for her efforts, Andie agrees, overrules her own doubts as well as her fiance Will's objections, and packs her bags. Of course, circumstances at the old house are far grimmer than North suspected. Twelve-year-old Carter and six-year-old Alice are unusual, to say the least. And desperately unhappy. Creepy old Mrs. Crumb, the housekeeper, seems to encourage Alice's tantrums and Carter's increasing isolation. And the longer Andie stays there, the more convinced she becomes that the whole place is haunted. She tries to convey the extent of the weird in her sporadic calls to North, but it's clear that saving these children from whatever dark force is lurking will be up to her and her alone. This book takes place in 1992. She sounded worried, and North tried to think of a way to make her feel better and then realized that was ridiculous. She was doing a job for him, she hadn't called for comfort, they weren't married anymore no matter what lies she was telling down there, he had Mrs. Nash waiting, and there was nothing he could do anyway . . . "Do you need me to come down there?" "No, I can handle this," she said, her voice as confident as ever. "It's the kids I'm worried about. I don't know if I can make things normal for them. I think I can make things better." "You always make things better." The silence stretched out at the other end of the phone as he thought, Dumb thing to say, and then she said, "Thank you." Her voice was softer than it had been, and it brought the past rushing back again. "You're welcome," he said, thinking, Get off the damn phone. "I'll get you your cable and your contractor and somebody to fix the phones." "I know you will. You always come through." Jesus. "Call me if there's anything else," he said briskly, trying to find his way back to normal. "I thought we weren't supposed to talk to each other." "I was going through an independent phase," North said, and then closed his eyes as her laugh bubbled through the phone. "That was a helluva long phase. I'll call if there's anything else. You have a good day." She hung up, and he sat there with the phone in his hand for a minute, trying to find his way back to normal. There's a lot going on behind those words, and one of the highlights of this book was tracking down those hidden histories, following the progress of this relationship that ignited, flared out, and is trying to find its way back to normal. Another highlight was far and away Andie's relationship with the two kids. Alice and Carter are just barely hanging on. I loved them immediately, and if North did nothing else admirable in this book, I would love him for sending them Andie. She's strong and mouthy, and without blinking an eye she sets herself up as their protector, promising she won't leave until she sets things right. I lapped it up right along with them. Truthfully, I was glad she was there, because this book effectively creeped me out. The roaming spirits and the eerie, bloody history of the house's inhabitants slipped their icy fingers under my skin. And, while the last third of the story got a little too crazy, and I started wishing it had gone back to the restrained tension it mastered in the first two-thirds, I thoroughly enjoyed it for taking me away from it all, giving me characters I could root for, and sending chills down my spine. Okay, I've always kind of dismissed Crusie's books as chick lit and thought no further about it. But this review has me clicking the "Buy Now" button to get this on my Kindle ASAP. Seriously. You should get a royalty from my purchase at least. This sounds exactly like what I need at the moment. Jess, LOL. You know how to put a smile on my face. Hope it does the trick. And, FWIW, I do adore BET ME. The others . . . eh. But that one and this make me happy. Meghan, wasn't it such a nice experience? Hie thee to BET ME! One of my favorite narrators (Angela Dawe) is the narrator for the audiobook of Maybe This Time, but I've held off on borrowing it from the library because like you, I believe in not forcing a read when the time isn't right. But maybe now, the time is right to listen to Maybe This Time (because I just read The Turn Of The Screw, and while I was meh about it, I do like retellings of it like Tighter by Adele Griffin). April, really? I'm jotting down her name now. Good to know. I felt the same about TURN OF THE SCREW. But this one I loved. This sounds different and refreshing. I, too, need to pick it up when the time is right. Holly, when it's right, I think you'll eat it up. Andie and North and the kids are utterly charming. Funny - I have a copy of this. I've had it for ages. I LOVE Crusie (despite the fact that some of her books are definitely misses, especially compared to Bet Me). Allison, yeah. Compared toe BET ME, it's hard to measure up. Must be frustrating for her. I too went on a Cruise book binge after reading Agnes and the Hitman. Some didn't quite live up but your review has me re-adding Maybe This Time to my queue. Heather, a nice binge is the only way to do Crusie, IMO. Maybe I did this one at the wrong time. I didn't love it as much as you. In fact it was a pretty big miss. I had just done a bunch of Kristin Higgins and was looking for something similar. Maybe it was a miss in comparison to that particular author? Hmm...Guess I'll chalk it up to wrong time for the book. librarian, I'm sorry. I can see how it wouldn't be your cuppa after some Higgins goodness. It seems to be pretty different from Crusie's usual fare as well. So I'm sure you'd have to be in the mood for some gothic, mystery, farce, I think.